Imagine the area comprising Manuel Antonio National Park, one of the top tourist destinations in all of Central America, just minutes away from being bulldozed by some developers needing room for their environmentally UNFRIENDLY project. That was the situation in 1972, so the story goes, when the Costa Rican government stepped in just in time to save our beloved national treasure. Talk about a close call! What do you help save when you rescue even a tiny piece (1,700 acres) of one of earth's last rainforests, and preserve it for the enjoyment of nature-lovers the world over? To begin with, over 350 species of birds, including 15 species of hummingbirds, toucans, and occasionally the majestic scarlet macaw. Also, it's one of the few places in the world you'll find the endangered squirrel monkey (mono titi), along with the larger white-faced capuchins and howler monkeys. Likewise, you help preserve the two and three-toed sloths, large green and black iguanas, white-nosed coatimundis, agoutis, numerous lizards, butterflies, and assorted snakes. And in some of the more remote areas you might be preserving the habitat of caimans, marmosets, river otters, ocelots, and pacas. To get to the current park entrance (not shown on the map), take the road next to Marlin's restaurant (in front of the beach), then the first Right. The entrance is directly ahead. 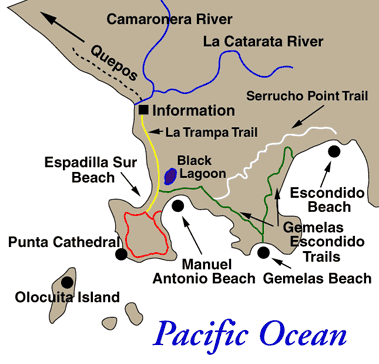 A popular time to visit Manuel Antonio National Park is around 7am, when the park opens. It's cooler, and the sun's rays are less direct. A number of official guides are there with their scopes, ready to guarantee some wildlife encounters. The plus for hiking the park later in the day might be some opportunities to see birds and animals that otherwise flee the much larger crowd of visitors when the park first opens. Manuel Antonio National Park is closed Mondays. A number of tour companies also include guided treks through the park or in combination with other activities. Before, after, or in between your hiking enjoy a refreshing swim, or snorkeling at Playa Manuel Antonio with it's coral-white sand and small coral reef. It's a pristine beach, untainted by commercial development, and has fairly clear water due to it's position with respect to wave action. To the far right of Playa Manuel Antonio, check out the pre-Columbian turtle traps dug out of stone by the former Quepoa Indians for whom the town of Quepos is named. A great afternoon activity would be a hike to the lookout point of Punta Catedral where you might see spotted, bottle-nosed, or rough toothed dolphins, killer whales, or even humpback whales passing by on their migration routes. One final word. While in Manuel Antonio National Park, or anywhere in Manuel Antonio for that matter, please, PLEASE DO NOT FEED THE MONKEYS! For a whole list of reasons it is one of the worst things you can do. If you care about whether the fragile monkey populations thrive instead of continuing to diminish, resist the temptation. If you're a PARK GUIDE or a TOUR COMPANY offering guided tours through Manuel Antonio National Park, this is your opportunity to introduce yourself and/or your tour. SHOW the visitors of this site what interesting WILDLIFE they may get to see if you're their guide. Let's see your best wildlife photos or videos! If you're a guide, maybe include a photo of you! Also list your qualifications, special skills, and experience. Tell us why a customer should choose you as their guide or tour company. Your listing will appear on a Web page exactly the way you enter it here. You can wrap a word in square brackets to make it appear bold. For example [our tour] would show as our tour on the Web page containing your ad. Do you have some pictures or a video to add? Great! Click the button and find the first photo on your computer. Select it and click on the button to choose it. For a video, simply go to your YouTube account, UPLOAD your video, COPY the Embed Code for the uploaded video, then PASTE it in this box with the rest of your ad.